There is good news for Michelle Bachmann in a Rasmussen Poll released today. It shows her holding her own with Governors Romney and Perry. She has a substantial lead among Evangelicals, Catholics, Tea Party members and conservatives. We have no doubt that Bachmann's numbers will only improve when Republicans become more familiar with the big government, big spending, liberal records and globalist views of Romney and Bilderberger Rick Perry. 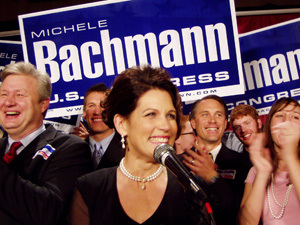 Rasmussen reports that Sixty-eight percent (68%) share a favorable opinion of Bachmann, with 36% "very favorable." She’s viewed unfavorably by 22%, including nine percent (9%) who hold a very unfavorable opinion. Governor Perry's unfavorable number is more than twice that of Congresswoman Bachmann.